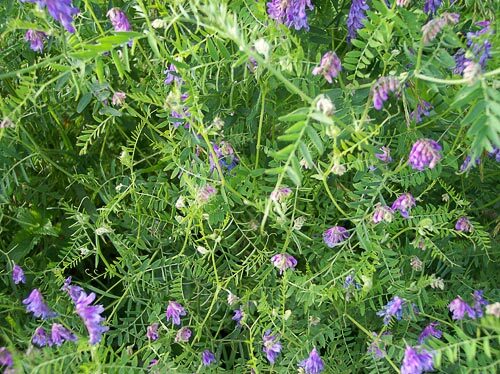 AgroAtlas - Crops - Vicia cracca L. - Bird vetch. Vicia cracca L. - Bird vetch. Family Fabaceae Lindl., triba Vicieae, genus Vicia L.
2n=14, 28. Biennial plant (lifetime 8-12 years), height 30-200 cm, dense shortrpuberulent, sometimes grey, less often dispersed pubescence and almost naked. Stalks weak, thin, climbing, branchy, almost upright, angled. Tendril branchy. Stipules half-arrow-shaped, at top leaves - integral, lanceolate or linear, less often with 1-2 denticles. Leaflets 8-12-pair, lanceolate, oblong-elliptic, top rounded or pointed, 15-25x2-5 mm, shortly dense pubescence from both sides or only from below. Peduncules from 10 up to 100 mm. Inflorescences 20-40-flowers, usually compact. Flowers 10-12 mm length. Calyx short-campaniform, pale, denticles lanceolate, bottom denticle is little bit longer. Corolla bluish - violet, pale - lilac, purple-violet, less often white. Carina and wings with a white stain, their bases are white. Column is compressed from sides, around fibrous. Beans oblong-rhombic, with sidelong chopped ends, compressed, grayish, naked, with thin walls, 15-20x4-5 mm length, contain 4-8 seeds, spherical, 2.5-3.5 mm diameter, black or olive, spotty. Weight of 1000 seeds 7 -20 g.
Origin related with temperate cold flora of the former continent Angarida apparently. Has extensive palaeoarctic area. One of the most plastic species. It is distributed on all Europe up to tundra of Arctic regions. Introductory in culture in 2000 in The Volga region scientifical-research institute of selection and seed growing named by P.N. Konstantinov. Grade Srednevolzhskaja 98. Sort characterized with high winter-hardy and early growth in spring. Water-resistant plant. The contents of protein in dry substance of green mass vary from 16.44.till 22.87 (30)%. 1 kg of forage contain 109 mg carotene, 120-300 mg% vitamin C. Productivity of green mass 3.2-5.1 ton per hectare, and of seeds 0.1 ton per hectare. Grade characterized ny high winter-tolerance and early growing in spring. Destined for meadow creation on inconvenient and worthless lands, but also for haymaking-pastured using. Cultural flora. Vol. IV, part 2. VETCH / S.I. Rep.ev, A.K. Stankevich, ed. by S.I. Rep.ev. St.-Petersburg, 1999. P. 167-170. Nikiforov O.S. Wild growing vetches of Siberia. Novosibirsk: Nauka, 1988. 136 c.
Rep.ev S.I. Intensification of vetch production. Leningrad, 1988. Flora of Central Siberia. Vol. 2. Novosibirsk, 1979.